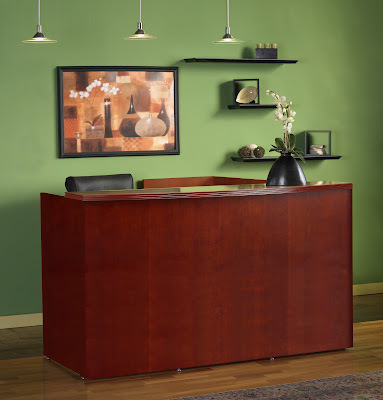 The Luminary reception desk collection sends a positive statement about your business. With the Luminary discount office furniture collection you can NOW produce a WOW factor as your clients enter your front door. These reception desks are available with a choice of veneer or frosted glass transaction counters, along with many office storage cabinets to help keep documents and supplies in their place. The Luminary reception desks and office furniture are within reach of even the tightest of budgets. Offered with cherry or maple wood veneers these reception desks are sure to impress. From the executive office to the boardroom, our Luminary office furniture provides attractive yet affordable furnishings. To complement your reception desks, we offer many choices of lobby chairs, small tables, and sofas. Reception desk furniture is highly visible and it must be durable. If you choose the right reception desk and furniture it can make the image of your business long lasting. You get only ONE opportunity to make a first impression to your customers _ with the Luminary reception desk you can make it a good one and save time and money in the process! Our office furniture specialists will help you choose the right reception desk and office furniture to fit your companyÍs needs, as well as your budget.